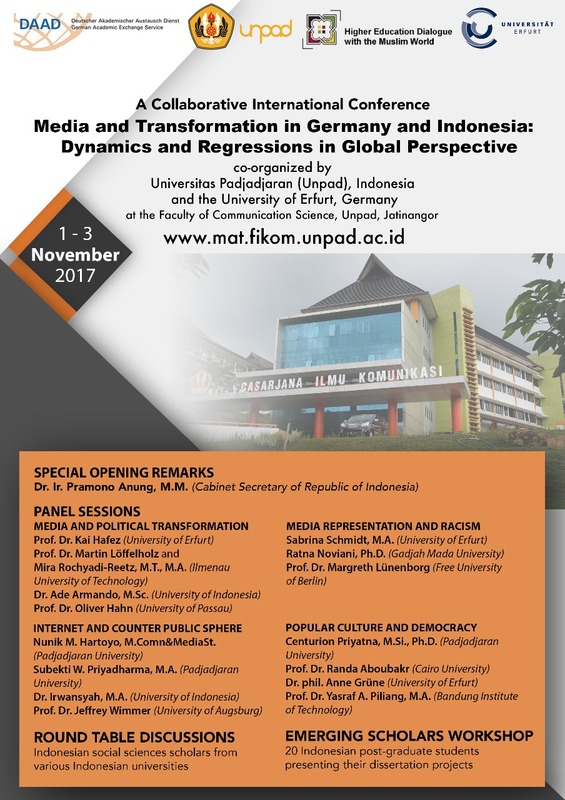 As a part of the DAAD (German Academic Exchange Service) Program Higher Education Dialogue with Muslim World, Universitas Padjadjaran (Unpad), Indonesia and the University of Erfurt, Germany have agreed to hold an International Conference on Media and Transformation in Germany and Indonesia, focusing on their dynamics and regressions, which is seen from the global perspective. It is part of a three-year cooperation between these two institutions that kick started back in 2015. More on the cooperation here. The conference aims to enhance mutual understanding between the two countries by examining the types and patterns of public communication in respective countries through a shared perspective. This will be done within three dimensions: (1) the comparative dimension between Indonesia and Germany and/or between the Islamic world and the Western world, (2) the dimension of socio-political transformation of both nations in the context of globalization, and (3) the dimension of media and communication culture, which refers to four subtopics: Media and Political Transformation, Media Representation and Racism, Internet and Counter-Public Sphere, and Popular Culture and Democracy. More on the subtopics here. Three types of conference sessions are designed to attain the conference goals: (1) panel discussions, (2) roundtable discussions, and (3) emerging scholars workshop. Different speakers/presenters are invited/selected for each session. Consequently, different conference outputs are expected from each session. More on the conference sessions here. Copyright © 2019 Media and Transformation in Germany and Indonesia. Powered by WordPress. Theme: Spacious by ThemeGrill.